Farro might just be my new favorite grain. The first time I tasted farro, I was struck by the texture. I savored the sensation of the chewy kernels as they rolled around my mouth, slightly resisting my bite but yielding into a burst of nutty and earthy flavor. What I realized is that texture is one of the characteristics I like most about food. Obviously, taste and aroma are important but texture contributes a layer of complexity that makes eating such a sensual experience. For some people, texture is a make or break deal with food. Take oysters on the half shell, for example. I have friends who are completely repulsed by the thought of swallowing one of the slippery, pearl-bearing mollusks. I adore them, texture and all. My partner, Jim, cannot bear eating coconut because of its grasslike, shredded texture. I love coconut in any form. Some think the slimy texture of okra is the most disgusting thing ever. Love of okra lives in my DNA. Texture makes food interesting. The beauty of this salad is in its simplicity. 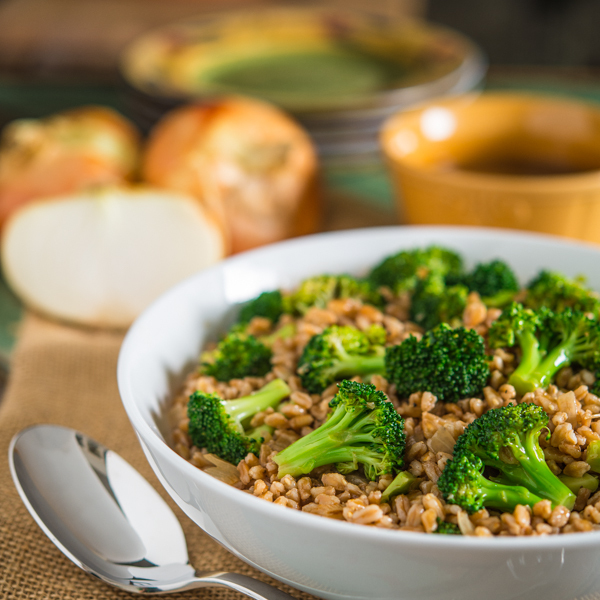 The textural contrast of the farro and lightly blanched broccoli stands front and center while the tart and creamy vinaigrette envelops the sweet Vidalia onion in the background. 1. Heat olive oil in a small skillet. Saute onion for 4 to 5 minutes over medium heat until soft and browning. Remove from heat and cool. 2. Whisk together vinegar, mustard, and honey. Slowly add olive oil, whisking until emulsified. Add mayonnaise, onions, salt, and pepper and continue whisking until well combined. 1. Bring chicken stock and water to a boil in a medium sauce pan. Add farro and reduce heat to simmer. Cover and cook for 20 minutes. Drain farro and cool completely. 2. Prepare ice bath with water and ice cubes in a medium bowl. 3. Bring 6 cups of water to boil in a medium pan. Drop broccoli into boiling water for 30 seconds. Remove from boiling water and immediately place in ice bath to stop cooking. Drain and set aside. 4. Combine broccoli and farro. Add dressing to taste and mix well. Add additional salt and pepper to taste. Yum! I had a bag of Farro in my cabinet that I had no idea what to do with and stumbled upon your recipe. I also added some fresh chopped tomatoes that I had on hand. Delicious! Farro has been one of my favorite grains for years. I’ll cook and eat it plain or make salads with it. Nice dressing for this one. I like the combo of balsamic and sweet Vidalia onion. PS. It was nice meeting you at the Dianne Jacob class.